Test Connections - March 2018 - Newsletter | Marvin Test Solutions, Inc.
March 2018 - NewsletterFocus OnSolution SpotlightProduct HighlightIn the NewsDid You Know? Welcome to our first newsletter of 2018 - a year that already promises to be filled with opportunities and growth. Our active international trade show schedule now includes not only Paris and Farnborough, but also Dubai and Singapore. The addition of these two major regional defense shows has enabled us to better interact and serve our growing customer base. We hope to see you at the Farnborough Airshow in July to discuss your test challenges and demonstrate how we can deliver solutions that meet and exceed your most demanding requirements. As always, you can count on MTS for innovative solutions that make test easy, and of course, our unrivaled long-term support. We’re excited to announce that we will be part of the BAE Systems-led team for the U.S. Air Force’s Bomber Armament Tester program, and that MTS has been awarded a contract by the U.S. Air Force Ogden Air Logistics Complex at Hill AFB to provide chassis and instrumentation for the production of PATS-70A test sets used for O-Level and I-Level maintenance of A-10/C aircraft. You can learn more about both of these mission-critical programs in the “In the News” section of this newsletter. We hope you enjoy this month's issue of Test Connections which includes new product updates and news events. Please send your comments or suggestions regarding this newsletter to marketing@MarvinTest.com. PXI has proven to be a powerful and robust standard that is suitable for most Mil-Aero test applications. PXI-based testers are widely used today in engineering test stations, as production acceptance testers, and as environmental stress screening testers, as well as full-fledged Intermediate-Level and Depot-Level testers. The manufacturing and test of avionics products for military and commercial aircraft presents a unique set of requirements and challenges. A common test platform and consolidation of test resources facilitates development and long-term support of complex, high-value assemblies. Virtually all ATE systems employ a switching subsystem in order to route test system resources to multiple test points on the UUT. The challenge for any switching subsystem is multi-dimensional and involves many considerations / trade-offs including footprint, performance, flexibility, maintainability, and reliability. The best test development and test executive software in the business just got even better! Register here to attend our upcoming webinar: ATEasy 10's New Features and Capabilities. Looking to generate test applications faster? Open-architecture-based ATEasy is the answer. Download your no-cost 30-day trial today! Register for the ATEasy® webinar to learn more about new features and capabilities. ATEasy® 10 SP1 is now available. Synchronizing Resources for Multiple UUT Testing Click here to learn more. Would you like to receive the Test Connections Newsletters on a regular basis? You can sign up at any time. Can't find what you're looking for? We'll build it for you. We also customize and adapt standard catalog products to meet your specific needs. Click here to request more information. While the above facts are widely known, a lesser-known fact is the success of PXI in field and flight-line test applications. Many engineers are not aware of the ruggedness of the PXI platform and as a result, PXI is sometimes overlooked when new portable and rugged test solutions are sought. PXI was designed as a rugged standard and while most test applications do not require operation in harsh environments, it is very simple to achieve reliable performance under these conditions. PXI includes two form factors: 3U and 6U. While 3U is the more popular of the two and most PXI instrumentation is available in this form factor, many products including high-density switching and high performance digital are only available in the 6U form factor. With full interoperability between 3U and 6U, the PXI backplanes employed by these testers offer both 3U and 6U PXI slots. 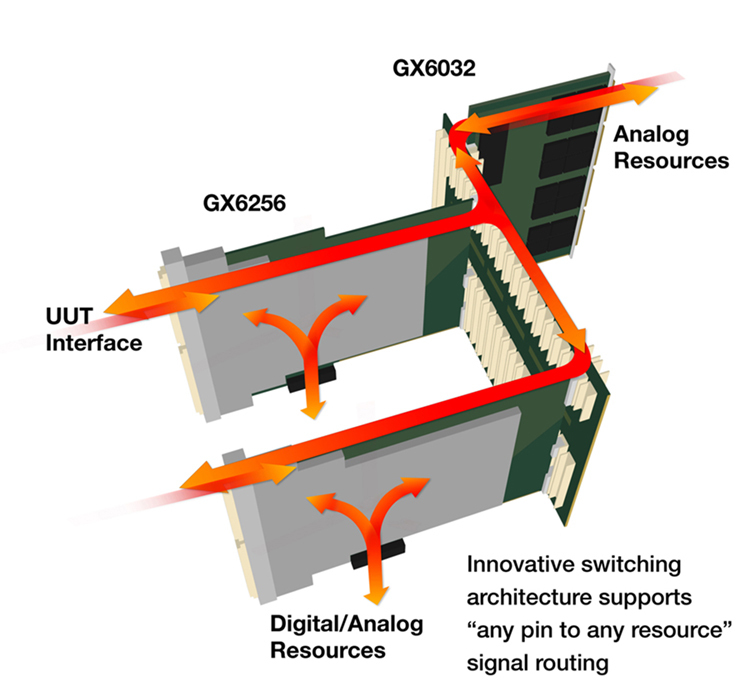 Of the 14 slots in the PXI backplane, seven slots are 6U and seven are 3U, to accommodate the instrument configuration best suited for the application. Marvin Test Solutions offers a comprehensive line of PXI-based test sets that demonstrate PXI’s viability as an ultra-rugged field and flightline platform suitable for conditions where only custom electronics or MIL-SPEC VME products were capable of surviving before. These test sets are all based on an ultra-rugged COTS PXI platform with a 14-slot backplane that has been successfully deployed since 2004, and all have demonstrated their ability to operate reliably in any operational theater, with hundreds deployed to-date. All of the test sets shown below are available in PXI and PXIe configurations. The MTS-207 is the core platform for Marvin Test Solutions’ portfolio of armament system test sets which employ the same field-proven architecture and compact, rugged design. The MTS-207 is ideal for test and data acquisition applications requiring operation under harsh environmental conditions including flightline, backshop, or airborne applications. MTS’ state-of-the-art test sets are designed to provide advanced test capabilities with a space-efficient, small footprint, suitable for O- and/or I-level use. The AN/TSN-205A/B are portable test sets designed to perform full parametric functional test with diagnostics to the LRU level on integrated Hellfire and Longbow systems as installed on the aircraft, as well as testing the entire fire control system from the cockpit switches to the launch rails. The MTS-206A is an I-level portable test set for the AGM-65 Maverick missile system and for AGM-114 missiles. The MTS-206A performs parametric functional tests on Hellfire missiles and on Maverick missile system components including: AGM-65 missile (all versions in tactical and training configurations), AGM-65 missile sections (GCS & CAS, all versions in tactical and training configurations), LAU-117 and LAU-88 Maverick launchers (all versions), and launcher-missile clusters. The MTS-209 is an O- and I-level portable test set for various armament systems used on the F-16, F-15, F-18, TA-50, FA-50 and additional aircraft, providing full parametric test with built-in diagnostics. The MTS-209 supports a wide range of Alternate Mission Equipment (AME) including launchers, pylons, and racks deployed on these aircraft. The MTS-235 is an O- and I-level portable test set for various armament systems used on the F-35 Joint Strike Fighter including launchers, pylons, and racks. The MTS-235 performs parametric functional tests on F-35 Alternate Mission Equipment (AME) components including Launchers (iARL and eARL), Pylons (Air-to-Ground and Air-to-Air) and associated subassemblies and adapters, with full support for the MIL-STD-1760 bus interface, facilitating the testing of smart weapon systems. The PATS-70 is an automatic test system designed to perform functional tests on the Fairchild Republic A-10C Thunderbolt II’s (A-10) IFF, Anti-skid, Alpha Mach, Stability Augmentation System (SAS), and Fuel Quantity Indicating System. Developed in conjunction with the U.S. Air Force, the PATS-70 provides the logic and hardware control necessary to coordinate and automate control of these system functions. The PATS-70 is an automated, user friendly, adaptable test set that provides robust system diagnostic capability, significantly reducing the time required to bring an aircraft into mission ready status. With this test set, the USAF has a flexible maintenance and sustainment solution capable of accommodating additional test instrumentation into the system as future test needs evolve for the A-10/C or even other aircraft. MTS was recently awarded a contract to provide chassis and instrumentation for the production of the next generation PATS-70A test sets as well as upgrade of PATS-70 test sets to the PATS-70A configuration. The PATS-70A adds armament systems test capability to the existing avionics test capability of the PATS-70. These PXI implementations demonstrate the robustness and ruggedness of PXI and establish PXI as a viable solution for any flightline or field test application. With PXI’s small footprint, low cost, and range of products to meet the requirements of just about any application, PXI should be the preferred choice for rugged military testers. Manufacturers of avionics products are constantly challenged to develop, manufacture, and maintain / service a diverse range of avionics products, including aircraft data acquisition and recording systems, navigation / communication solutions and aircraft network systems. These types of products which are deployed on virtually all commercial aircraft in operation today require rigorous functional testing as well as a robust test data collection system to ensure overall system reliability and traceability. Additionally, the long product life cycles for avionics products (typically more than 20 years for service and support) requires that the associated test systems be maintained and supported which can be both technically and financially challenging. To address the test requirements associated with these products, a major supplier of avionics products adopted the PXI platform as the core platform for their manufacturing test solution. Because of its broad variety of instrumentation providing test engineers with the flexibility to build and easily reconfigure a compact, small footprint test system, the design team selected Marvin Test Solutions’ GX7100 PXI chassis, instrumentation and ATEasy® software to provide the basis for their manufacturing test systems. With over 95 test systems deployed for both production and service applications, both current and future generation products can be addressed using a common core system. Previous generations of test stations based on custom or proprietary architectures would have taken years to develop, but by selecting a commercial off the shelf (COTS) platform as the core component, the system design could be completed in a few months. Standardizing not only on a hardware platform but also on an integrated test executive and test development software platform enabled the development and deployment of multiple test solutions, resulting in a significant increase in test program development productivity with an equally significant reduction in test program deployment time and cost. To learn more about the benefits of selecting a common core platform for development, production, and support applications, visit marvintest.com to read the complete article. Virtually all ATE systems employ a switching subsystem in order to route test system resources to multiple test points on the UUT. The challenge for any switching subsystem is multi-dimensional and involves many considerations / trade-offs including footprint, performance, flexibility, maintainability, and reliability. Additionally, if the application needs to address legacy test needs, there can be the additional challenge to support not only current and future switching requirements, but also legacy test requirements. The basic requirement for a switching subsystem is to route ATE resources to one or more points on a UUT, providing an efficient and flexible scheme for sharing / accessing test system resources to test points on the UUT. A switching system may be comprised of matrices and multiplexers in order to provide the necessary switching flexibility and functionality. Matrices offer N x M cross point switch routing and multiplexers provide expanded signal access via a 1 x K architecture. By combining matrices and multiplexers, a flexible and high channel count switching subsystem can be constructed that offers flexible ATE resource routing and supports high I/O pin count without the need to use a high number of relays. Marvin Test Solutions’ switch card portfolio includes matrix, multiplexer, and RF multiplexer configurations. 3U and 6U PXI switch cards feature easy to use, reliable, and integration-friendly D-sub style interface connectors - a feature unique to Marvin Test Solutions PXI switch cards. GENASYS switch cards are compatible with MTS’ family of GENASYS Switching and Switching/Digital Subsystems, featuring integrated MAC Panel SCOUT receivers. The development and implementation of a PXI-based switching architecture can meet the switching requirements associated with addressing high complexity / high performance functional test applications. And by employing an “engineered” PXI platform such as the GENASYS GX7016 and GX7017, test engineers have the opportunity to realize advanced ATE solutions that are compact, modular, and reliable for a broad range of high performance, complex test applications. The GENASYS platform and its subsystems leverage the advantages of PXI to address the most demanding test requirements, featuring an “any pin to any resource” signal routing capability and MTS’ SwitchEasy software tools providing end-to-end signal routing. Register here to attend our upcoming webinar: "ATEasy 10's New Features and Capabilities" to learn more about new advanced features and capabilities that allow test development teams to do more, better, and faster. Connect with MTS on social media (LinkedIn, Twitter, and Facebook) to learn more about how We Make Test EasyTM, and visit our YouTube channel to view our latest video: Making Semiconductor Test Easy. Our busy trade show calendar has brought us some exciting opportunities to connect with customers from all over the world and learn more about the test challenges they are facing. We've expanded our trade show reach to include more events worldwide, including airshows in Dubai and Singapore. We truly enjoy this interaction and we look forward to meeting with you at the upcoming shows and events listed below. The 2018 AUSA ILW Global Force Symposium & Exposition is a three-day event that will include presentations from the United States Army Materiel Command, the United States Army Training and Doctrine Command, and the Office of the Assistant Secretary of the Army (Acquisition, Logistics and Technology), as well as an exhibit hall featuring over 200 exhibitors. Find us in booth 1223. The annual Summit provides an opportunity for the entire Army Aviation Community to gather in one place at one time focused solely on Army Aviation issues. Soldiers, Industry, Acquisition, R&D, Retired, Veterans, Maintenance, Logistics, Simulation, Special Operations, Training and Doctrine, MEDEVAC, Active Duty, Army National Guard, U.S. Army Reserve, and Army Aviation Leadership all take part. Find us in Booth 1602. SEMICON West is the world’s marketplace for microelectronics innovation, featuring nearly hundreds of international exhibitors showcasing products and services across the manufacturing ecosystem—from design to manufacturing.. Find us in booth 1608 in the South Hall. The future starts at Farnborough International Airshow, where a long history rich in pioneering heritage meets cutting edge technology, bringing the world’s aviation community together to do business and innovate. ATEasy is a test executive and a rapid application development framework for functional test, ATE, data acquisition, process control, and instrumentation systems. It provides all the necessary tools to develop, deploy and maintain software components. The latest version, ATEasy 10, provides new and advanced features that allow test teams to do more, do it better, and do it faster. For more details on what's new in ATEasy 10, or to download the latest version, visit the ATEasy 10 product page. This download package contains all necessary files (including a Getting Started Guide, User’s Guide, Help files, etc.) as well as a 30-day trial license. What’s new in ATEasy 10? To learn more about how ATEasy allows test development teams to do more, better, and faster, register for our upcoming webinar, "ATEasy 10's New Features and Capabilities", presented by Ron Yazma, MTS’ VP of software and the architect of ATEasy.